When you’re writing a paper, it’s sometimes hard to figure out where to start. There are so many details to juggle and so much to remember: Where do the commas go in this citation style? Can I use footnotes? How many sources did I need to have? It can be tempting to make life easier by hopping online and starting your research process with a quick trip to Wikipedia. After all, isn’t that the point of the site? To put the world’s knowledge right at your fingertips? Well, yes, but there’s also danger lurking inside that resource. Since January 15, 2001, Wikipedia has been an informative, chaotic maelstrom of information online, collected, curated, edited, and revised by an army of volunteers all over the world. Since January 16, 2001, it’s been viewed with skepticism, suspicion, and downright hostility by many professors and researchers who worry about the accuracy of information that anyone can edit, change, or vandalize at will. That’s the central premise of Wikipedia: that anyone can add to the world’s body of knowledge. By taking the creation of an encyclopedia or reference database out of the hands of an elite few working for a top encyclopedia or dictionary, founders Jimmy Wales and Larry Sanger wanted to decentralize the organization of knowledge, allowing new voices to take part in the research and documentation process and creating a more responsive, flexible resource. According to Alexa Internet statistics, Wikipedia is the fifth-most-visited website on the Internet, with 495 million monthly visitors. It has collected more than 45 million articles, with more being added and expanded every second of every day. Or is it? All those statistics come from Wikipedia’s page on itself, which was last edited (when I wrote this) on June 15, 2017; the history log notes reversions of possibly improper material and vandalism several times in June 2017 alone. No wonder serious scholars don’t exactly trust Wikipedia. If a relatively benign factual history of a website has regular problems with vandalism and “improper material,” what might the entry for a controversial topic or person contain? This is why most professors refuse to allow students to use Wikipedia as a source for their papers. But scholars still worry. Although we can see what edits were made to a page, how do we assess what’s fact and what’s fiction? Or, even harder, what’s subjective (or just plain BS), and what’s objective? To assess this, Nature published a study comparing science articles on Wikipedia to their corresponding entries in the Encyclopaedia Britannica in 2005 (Giles 2005). The study found that they were comparably accurate: based on the study’s methodology, there were 2.92 mistakes per article for the traditional encyclopedia and 3.86 for Wikipedia. But Encyclopaedia Britannica disputed the methodology, demonstrating typical objections the traditional research community has do to anything that encroaches on their territory. Other critics point out the eccentric focus seen throughout Wikipedia, where the list of creatures that appeared in Star Wars movies in 2009 had more than 15,000 words, the entire entry on World War II had only 10,000 (Fletcher 2009). In an ideal world, according to many scholars, we’d never touch Wikipedia at all. The wisdom of the crowd just can’t be trusted above that of formal scholarly papers, journal publications, and books. But we can imagine that people probably said the same thing about the first printed books being untrustworthy compared to handwritten manuscripts produced by monks, or even about the first written texts in comparison to oral tradition. Wikipedia has a place in our lives and in our research process. You just have to know how to use it right. Wikipedia’s best use in formal research is as a starting point. Wikipedia should never be your only resource, even if your professor allows you to use the site for a paper. Instead, you can use Wikipedia to get an overview of the topic you’re working on and maybe find potential connections to other topics that can help you develop your thesis. When you’re starting your research process, it’s OK to click over to Wikipedia and read some articles on the topic, as well as other linked articles that can help you understand what other people are saying about the field. This can help you get additional perspectives and start to refine how you’re going to approach your paper. One great thing about Wikipedia that’s definitely relevant to academic research is the sources listed at the bottom of each article. These links can give you access to more generally trusted sources, like academic papers, magazine articles, and independent research on a topic. You shouldn’t rely completely on these links to provide all the sources for your paper, but again, this can give you a head start on the process. The most valuable links are to primary sources, which academics trust generally because their authors were there when the event happened and can provide a firsthand perspective. There will be opinions and subjective interpretations involved, but you know that because it’s not being presented as fact; it’s a person’s account of their experiences. Once you’ve found some potential resources through the Wikipedia article, you can then start searching your academic library or Google Scholar to look for academic journal articles and formal books on some of the topics you’ve narrowed in on. You can also look for texts by people mentioned in the Wikipedia article or use keywords from the entry to help refine your search. 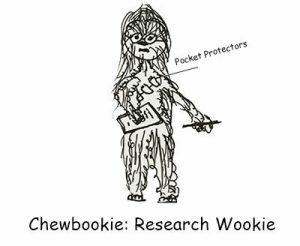 While the wisdom of the crowd doesn’t always rule when it comes to objective, fact-based research and writing (unless you’re writing a report on Wookies), Wikipedia offers a good way to get your head around a topic and to start narrowing down your research focus so that you can switch to using more commonly accepted sources. In other words, you can use the continually updating, frequently chaotic wisdom of the Wiki crowds to figure out what static sources might be the most useful to you, then proceed with your research from there.